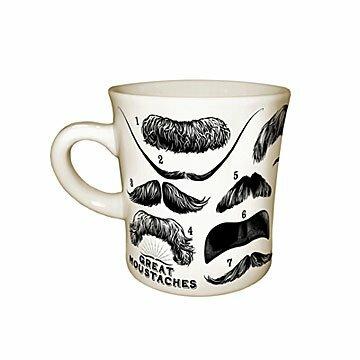 This epic mug is emblazoned with fourteen iconic moustaches from historical figures. No longer will people be able to merely gaze upon you and say, "That is one impressive moustache you have." Instead, as you stand sipping your coffee, onlookers will be dazzled by the sheer spectacle of the fourteen iconic and historical lip warmers that grace your mug. From push brooms to handlebars, you'll find the facial hair sported by some of the great men of poetry, art, science and philosophy. Not sure which stache is which? A numbered answer key is printed on the bottom of the mug for your post-beverage convenience. Made in China. I think the mug is awesome, it's funny and holds coffee like it is supposed to! my daddy has ALWAYS had & ROCKED a moustache. still does! he wouldn't be him without it, so I thought this was the perfect gift for Father's Day. Love how it describes the different famous moustaches on the box! Love this mug. It holds a decent amount which is nice because it was a gift for a coffee connoisseur by day and tea connoisseur by night. It was a big hit, his new favorite mug! The names of each of the 'staches is on the bottom for reference, which I thought was cute. My son was very excited about receiving this cup for Christmas. However, upon first use, he discovered that it leaks, right at the base of the handle. We are both very disappointed. Good to the last slurp! My hubby drinks his coffee every morning. the mug stays nice and hot. Perfect gift for a Birthday Present! Uncommon goods has been great to work with. I love the fact that they're a "B" company. We have a long line of great mustaches in our family, so this mug was a great gift.